Our air drying machine is also called air cooling line or air-cooled line, it is all made of stainless steel, easy to operate and with high efficiency, it is suitable for several of food and vegetable to do cooling or air drying after cooking, fixing, blanching, packaging sterilization. 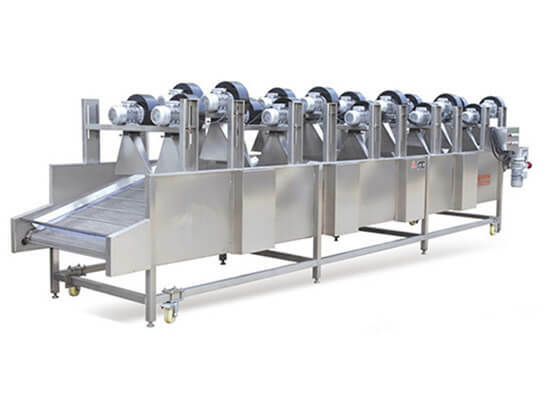 It is an ideal equipment for the food processing industry. 1. It is made of high-quality stainless steel, easy operation, high efficiency, low failure and low noise. 3. The air drying machine is convenient to use, with high water-remove rate and no ditches pollution on the surface of packaging. 5. Air drying machine supporting the use of sterilization pipeline, places in the back of the sterilization line. It is very suitable for the bagged product such as meat bagged product, vegetable bagged product to do drying work after sterilization. 6. Air drying machine is mainly used in the production line, the size can be customized. 7. It is suitable for boiled vegetables, seasoned vegetables, sauce, braised pork, spiced corned egg using plastic bags of packaged food. The materials are transferring through the mesh belt into the air drying machine, after repeated flip to achieve the materials can get multi-faceted wind and uniformity of getting wind, then through high-pressure of the hair dryer can make the food cooling or remove water from the surface, tuyere is wind knife-like shape, and effectively improve the amount of wind pressure which make the surface water of the material blow away or evaporation in a short time, facilitate storage or further processing.